Charlotte has gotten through the first three vaccine shots. She has had to be in NYC each Friday since March 31st. Although she is used to shots from receiving 10+ monthly, this shot is a thicker and larger amount. It has been described by older children as being similar to the way hot bacon grease feels. Another question many have asked is if she is actually “clear.” While we don’t take the news “no evidence of active disease” lightly, We REJOICE with this news. Unfortunately she is not considered NED (no evidence of disease) and there is a chance we will never see clear scans. To briefly describe this to you it means, if we took Charlotte to a hospital tomorrow, one that did not know her history, they would want to start high dose chemo, immediately. Her scans still don’t look good. 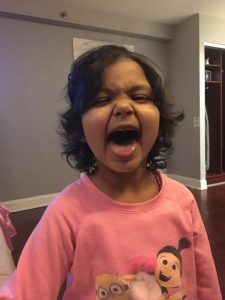 We have been fortunate enough to take her to one of the BEST hospitals for treating Neuroblastoma and are trusting the doctors opinion that her disease is matured. 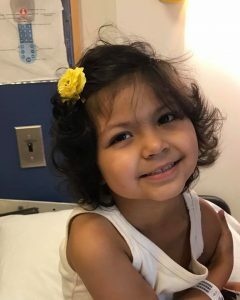 Her bone marrow results coming back clear, is huge! At diagnosis her marrow was 100% infiltrated with disease. One of my thoughts and prayers has been that Charlottes disease is completely dead and her testimony, as a child and adult will be to share God’s mercy. Part of her story will be that she STILL has 6 tumors in her body along with an unknown number of soft tissue spots. That she will lead others with her faith and miracle to our Lord. Tyler and I are ecstatic to be able to have a semi normal life. We thank God and continue to trust he is healing our baby girl daily. With that being said, we know there is a chance the fight continues. This vaccine trial she is on, will go over the next year. 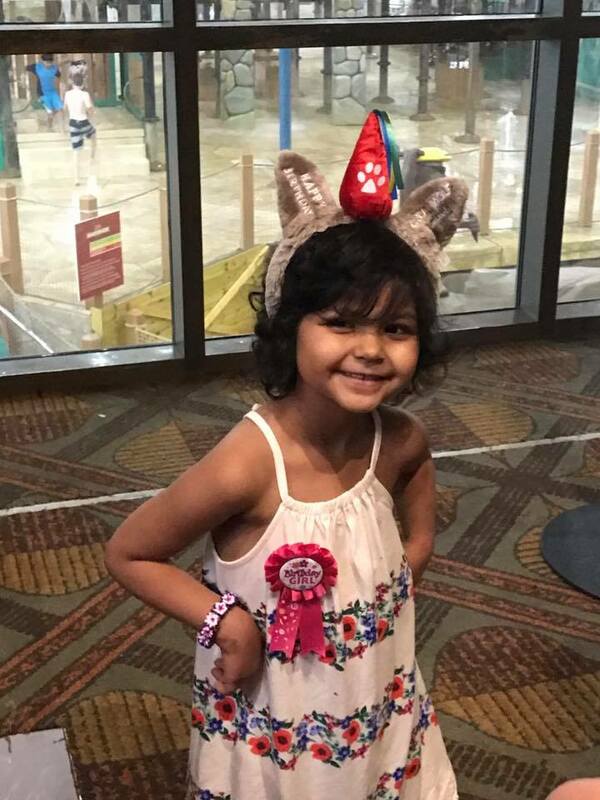 During this she will continue to have tests, scans, and blood draws. They will monitor her and keep a close eye on her cancer. Charlotte is doing wonderfully! We celebrated her 5th birthday with a trip to Great Wolf Lodge in Grapevine Tx. She absolutely LOVED it! It was the best feeling to be able to watch her act like a 5 year old. Please don’t stop praying for Charlotte. Thank you for the update on Charlotte. So, glad to know that God is still blessing her and her parents and sibling. Praise God for all that he has done and keeps doing. Thank you, Lord, our father. Thank God. Good news during our Easter season. Tears and prayers continue. What wonderful news!!! Will continue to pray for complete healing!! That precious smile on that face is priceless. Thank you Lord!!! I am thrilled to hear that Charlotte is doing so well. Happy Easter…the Lord has been showing me some amazing things lately and I hope that you too will be excited to hear from His word. Isaiah 52:14 says that Jesus was marred more than any other man and Isaiah 53: 4 – 5 says that “Jesus bore our griefs (translated “sickness” in the original text) and that He carried our sorrows ( translated “pains”). He was wounded for our transgressions, He was bruised for our iniquities, the chastisement for our peace was upon Him, and BY HIS STRIPES WE ARE HEALED. This is NOW – not someday. When Isaiah spoke of Jesus being marred beyond that of any other man he is not talking about what the Roman Soldiers did to Him…He is talking about our Lord and Saviour being assaulted with every sickness and disease that satan could throw against Him, every kind of cancer (neuroblastoma included), tumors, every disease known to man was placed on our Saviour – Jesus. That is why He was marred so badly…John 10;10 says the “thief comes to steal, kill and destroy, but Jesus came to give us life and life abundantly.” Charlotte is the HEALED, WHOLE and COMPLETE according to what Jesus – our LORD and SAVIOR did on the cross. His blood covers Charlotte and the enemy – satan – has no authority in her life. Jesus has paid for her to be free and to walk in perfect health. I challenge you to declare that Charlotte is HEALED, WHOLE and COMPLETE because of JESUS and what HE accomplished on the cross. We need to do as God does in declaring the end (outcome that we desire) from the beginning. Jesus was our example when HE walked on this earth, HE never turned down anyone who came to HIM for healing. The bible says that HE is the same yesterday, today and forever. HE IS OUR HEALER. Do not allow any one to tell you differently. JESUS IS OUR HEALER – and HIS WORD is TRUE. Stand on it. BELIEVE. HAVE FAITH in GOD for NOTHING is IMPOSSIBLE for HIM. Have a wonderful EASTER and please know that your Heavenly Father loved you so much that He gave His only begotten son – so that you might have LIFE. Speak LIFE into Charlotte’s body. Declare His Word over her. God is on your side. PRAISE HIM FOR HIS AMAZING WORD – there is power in DECLARING HIS WORD. Charlotte looks so beautiful and happy!! May God continue healing her and blessing your wonderful family. She looks just beautiful in those pictures! Hope she is getting all the cards we send! Hope to see you soon!